When the weather grows cold, as it has been in Arizona lately, a nice pot of beans sounds good. A good choice for beans is the native bean of the area, teparies. Teparies originally grew wild, but many generations ago the Tohono O’odham people domesticated them and grew them with the monsoon rains. They had many natural color variations, but when irrigation made possible the growing of pinto beans, farmers switched to the new crop and many of these varieties were lost. Why are teparies important in the bean world? They rank slightly higher in protein and niacin and quite a lot higher in calcium. They also have a low glycemic index, which protects people eating them from a dangerously rapid rise in blood glucose levels. Today, interest in teparies is increasing and the market for them is growing as people learn of their sweet flavor and health aspects. 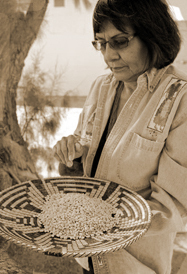 ” My father, Francisco “Chiigo” Smith, an O’odham farmer, grew many traditional crops on my mother Margarita’s 10-acre allotment located near Sacaton on the Gila River Indian Reservation in Arizona. My mother was an herbalist and traditional healer. Together they taught me the value of our traditional foods as being important to our daily nutrition and way of life. My husband, Terry, and I began farming on that very same allotment in 1974. Our first crops were barley and alfalfa. After expanding a few years later by leasing land from my relatives and other community members, we added cotton, corn and wheat. In the late 1970s, some community elders asked us to grow the Bafv (tepary bean), which had nearly become extinct. 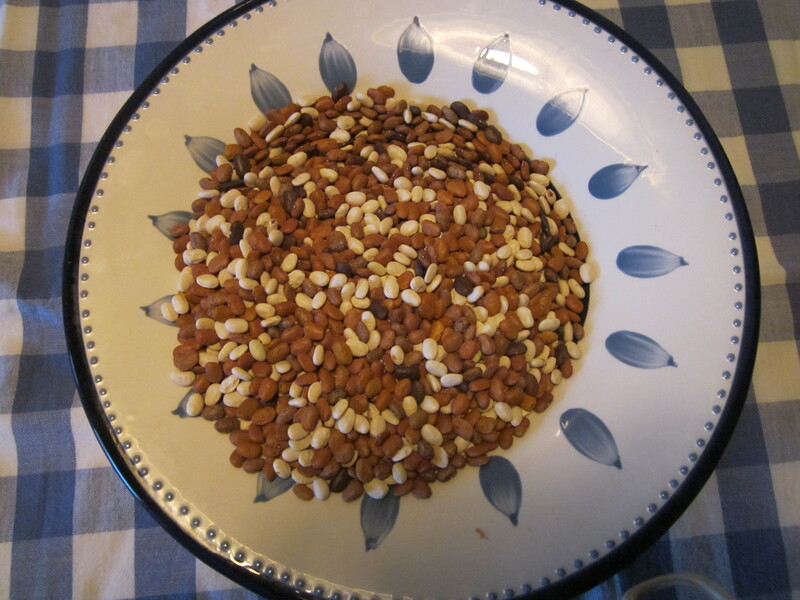 We discovered that my father had left a few seeds of the white and brown tepary beans in glass jars in a trunk in the old adobe house that I grew up in. It became clear to us, especially with the urging of our community elders, that it was to become our mission to help bring the bafv back to the community. You can learn more about Ramona Farms on their website. You can also taste some of Ramona’s delicious beans in traditional recipes this Saturday at the Heard Museum in Phoenix from 10 a.m. to 2 p.m. I’ll be appearing with Ramona and her helper Leslie and I’ll be offering some modern dishes using teparies — I’m considering tepary vegetarian pate and tepary brownies. We’d love to talk to you and offer you some delicious tastes. You can find these recipes and more in my latest cookbook Cooking the Wild Southwest. The Heard Museum bookstore will have copies for sale or you can get a copy at your local independent bookstore or on-line.